It’s always recommended to have a backup of your data, let it be your website files or email messages. 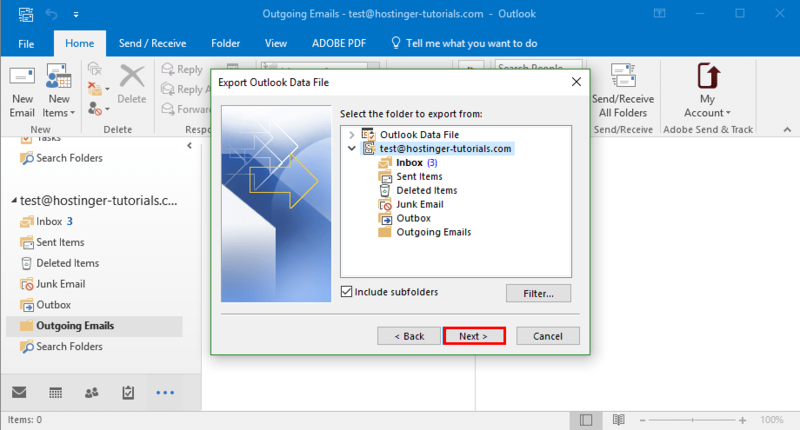 In this tutorial you will learn how to backup/export your email messages using three popular desktop email clients. Before starting, it’s worth to get the basic understanding of incoming mail protocols and their differences. In short, there are two incoming mail protocols: IMAP and POP3. The main difference between these two is that IMAP allows synchronizing email among multiple devices. Unfortunately, synchronization is not possible with the POP3 protocol. Another big downside of POP3 is its inability to export sent/outgoing email messages to the desktop email client. Thus, if you have IMAP enabled for your account, always use this protocol. For more detailed explanation about differences between IMAP and POP3 see this tutorial. Access to your hosting control panel. 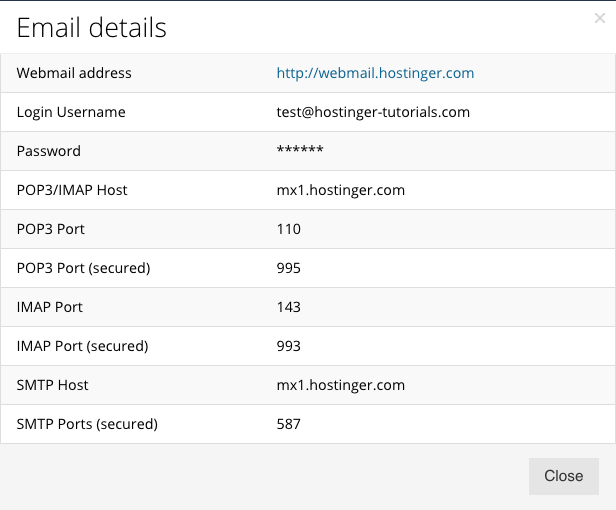 Access Hostinger control panel and input Email in the search field. Click on the Email Accounts icon. Hit Manage button next to your email account and click on Info. A pop up with available email details will appear. Write down these details or copy them to a text editor on your computer. 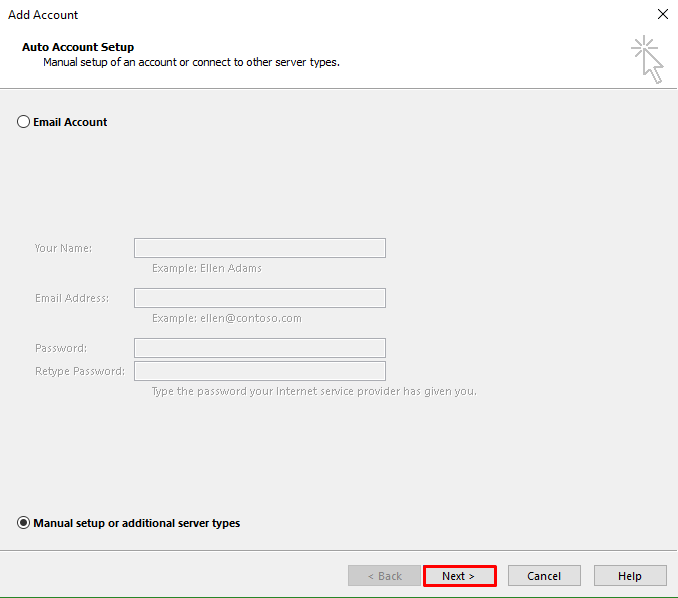 Once you have the email server details, you can proceed with the configuration of your email client and the backup creation of your email(s) messages. 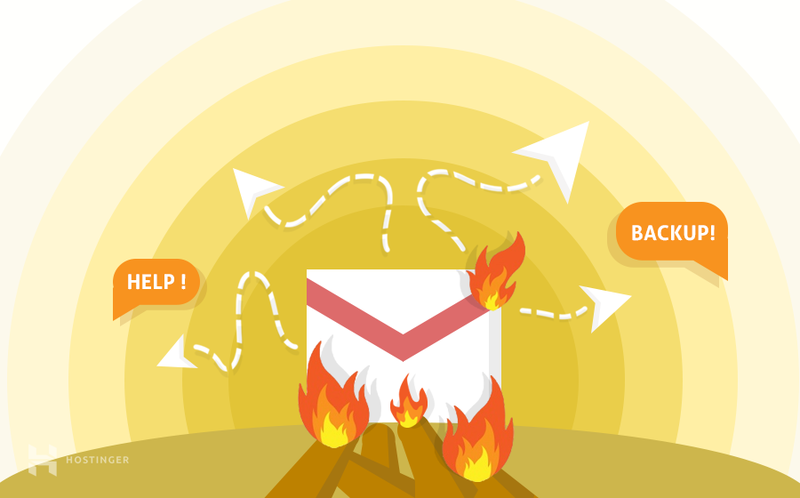 Below you can find steps showing how to backup emails on three different email clients. 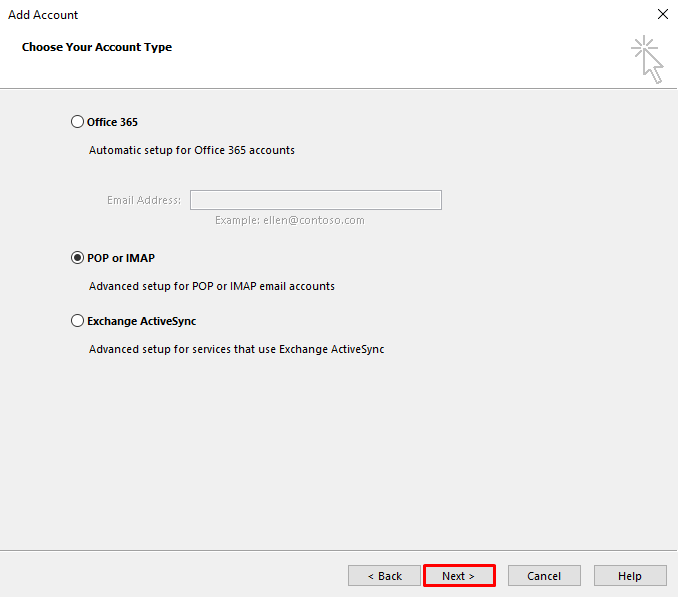 Begin with adding your email account to Outlook. In the example below, you can see how it is done in Outlook 2016. 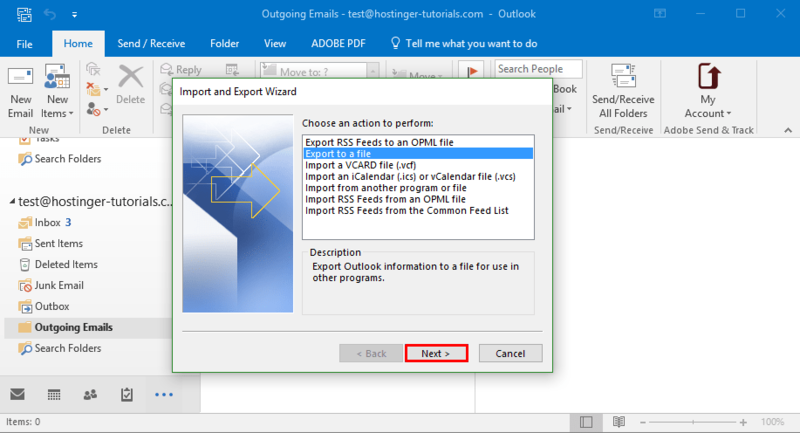 For instructions on how to do the same on Outlook 2013 see this tutorial. 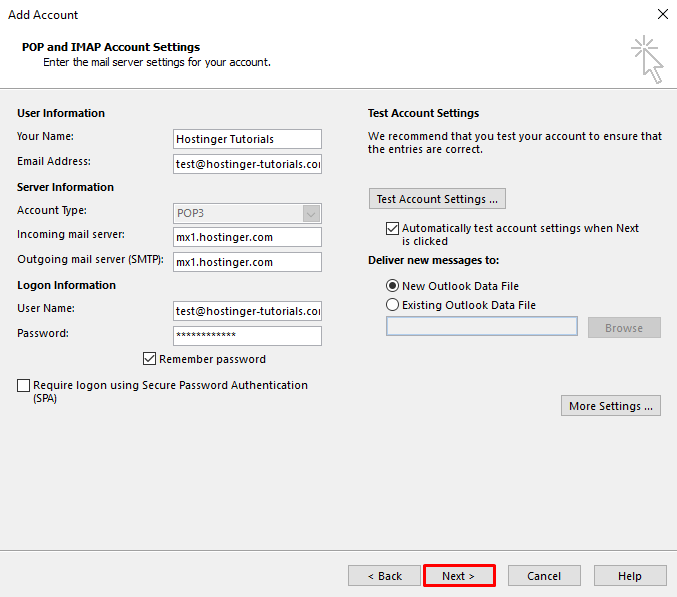 Open Outlook and click on File -> Add Account. On a new window choose Manual Setup or additional server types option and click Next. Click on POP or IMAP and hit Next. In a new window enter the details you have acquired in the first step and press the Next button. To complete the configuration press Done. Click File, choose Open & Export and click on the Import/Export button. On a new window choose Export to a file option and hit Next button. Choose export file type. 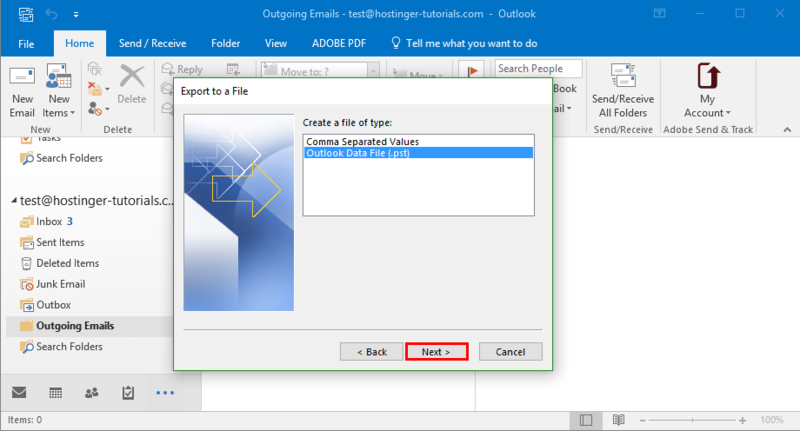 For this example we will select Outlook Data File (.pst). Click Next. Now select your email account from the list and again, click the Next button. Finally, choose the destination folder and hit Finish button. You will find a backup of your emails in .pst format within the choosen folder. 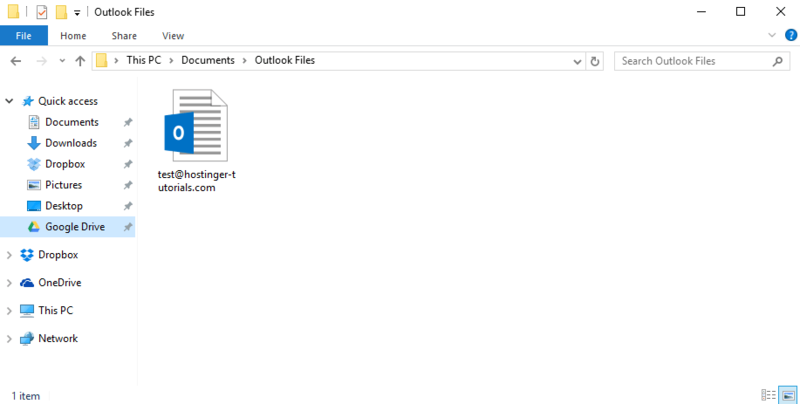 As you can see, creating an email backup on Outlook is easy and takes just a few minutes. On the first screen choose Skip this and use my existing email since you already have an email account. Now enter your name, email address, its password and click Continue. On the next step Mozilla will try to automatically retrieve the email server details. In most cases it will fail. Thus, you will have to input them manually. Simply enter the details from the first step and press the Re-test button. If you do not get any errors, hit Done button. 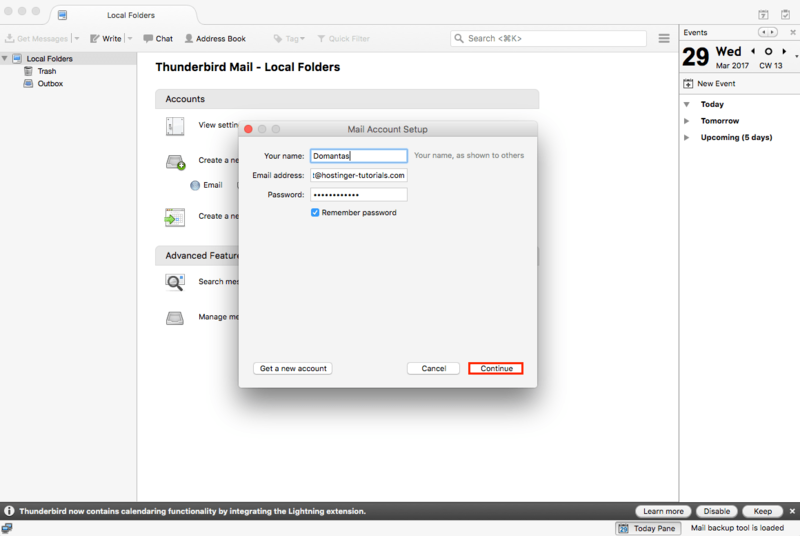 You should notice that Thunderbird does not show any of your emails. To download email messages from the server press Get Messages button. Create a new folder on your computer and name it Email Backup. 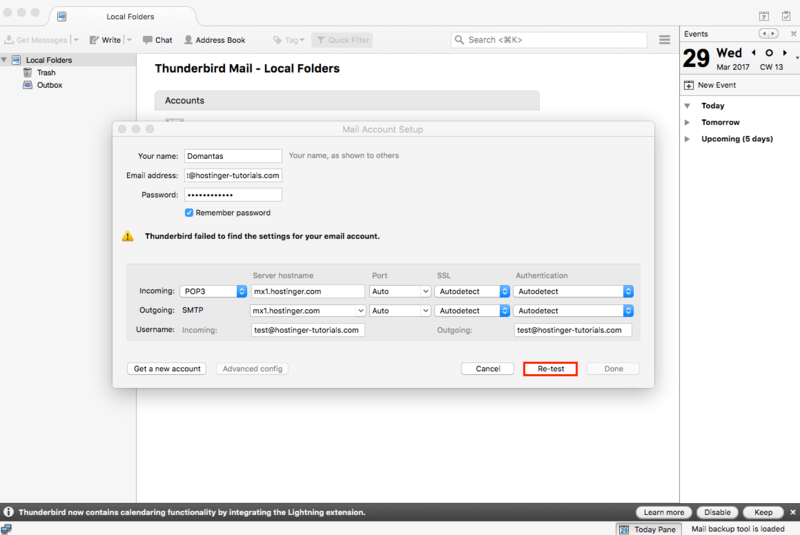 In Thunderbird access the email folder you want to backup. 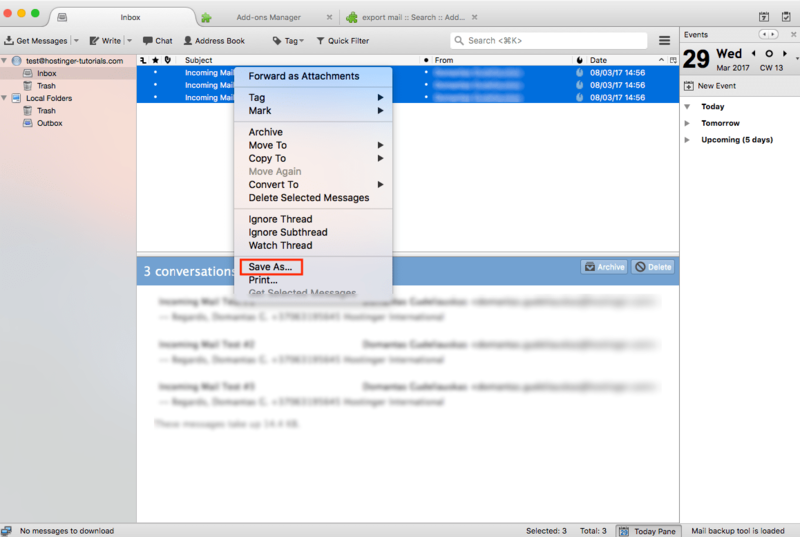 Use CTRL + A (CMD + A for MacOS) and select all messages within the folder. Right click on the email messages and choose Save As option. Choose Email Backup as a destination folder. 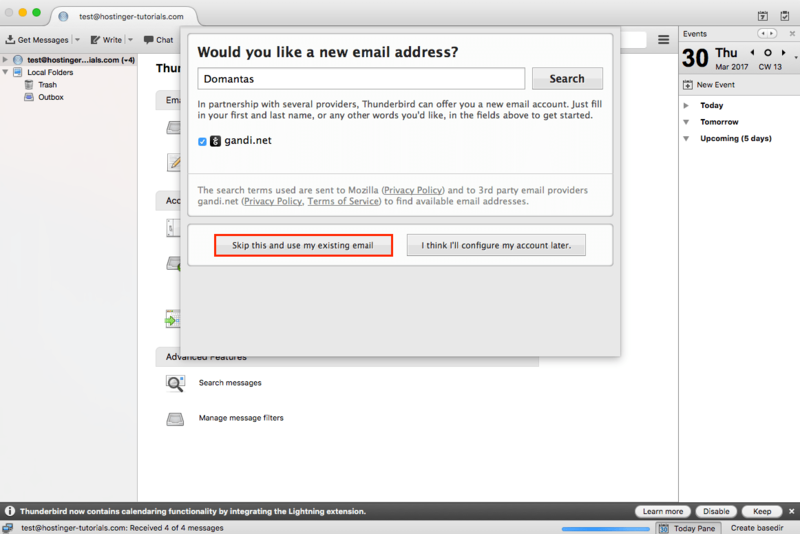 That’s it, Thunderbird will export all selected email messages in eml format. You have successfully downloaded all incoming email messages and saved them on your computer. 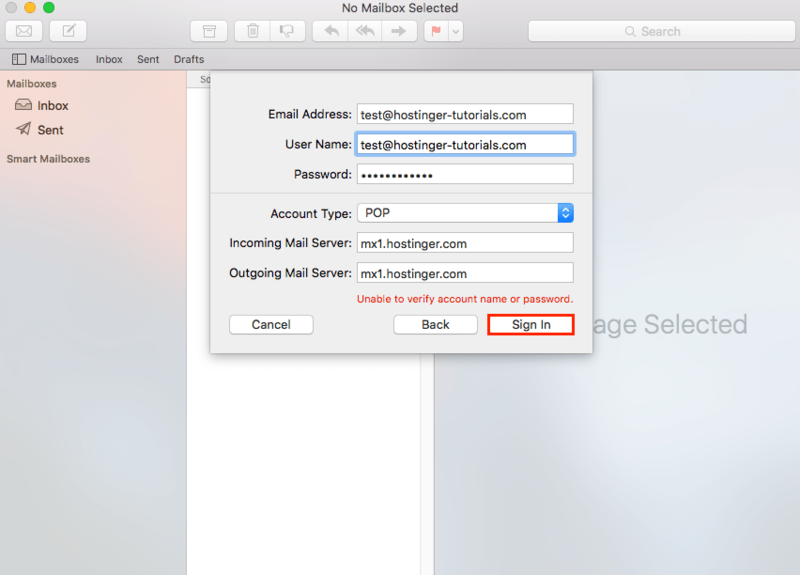 Launch Mac Mail and choose Mail -> Add Account. 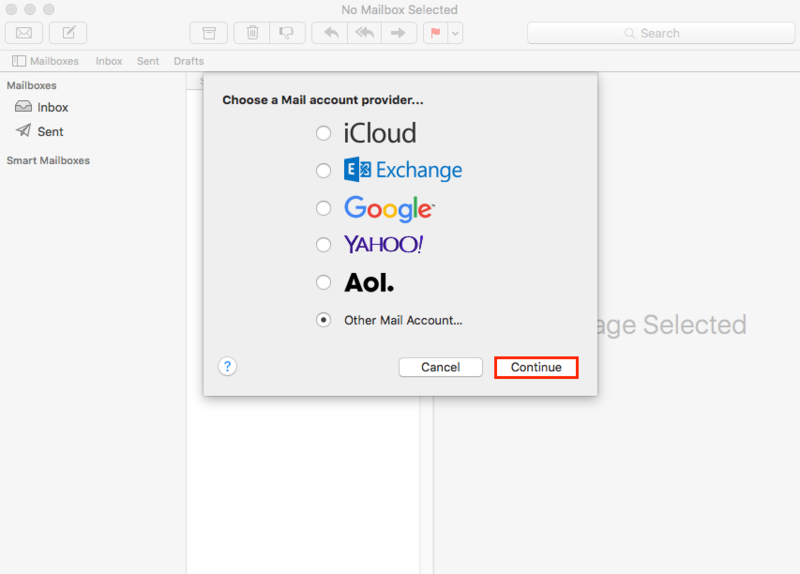 Choose Other Mail Account… option and press the Continue button. Enter your email details from the first step and press Sign In. If the details you entered are correct, Mac Mail will sign in and download your latest emails. 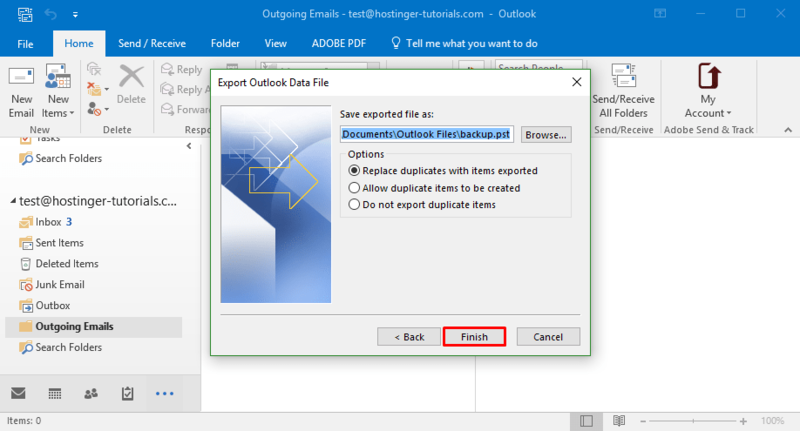 Right click on the email folder you want to backup and choose Export Mailbox. Choose a destination folder and press the Choose button. Mac Mail will export your emails in form of mbox archive. 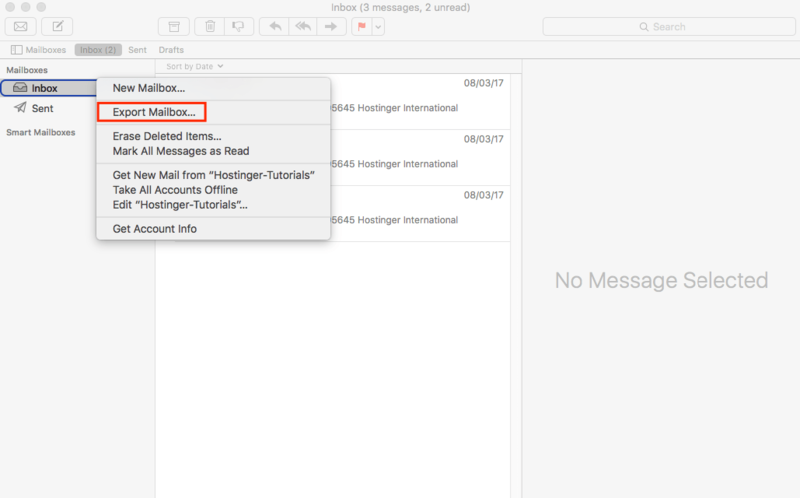 That’s it, you have successfully backed up your email by using Mac Mail client. mbox format is broadly supported by all major email clients. Thus you should not face any trouble if you decide to migrate to a different email client. 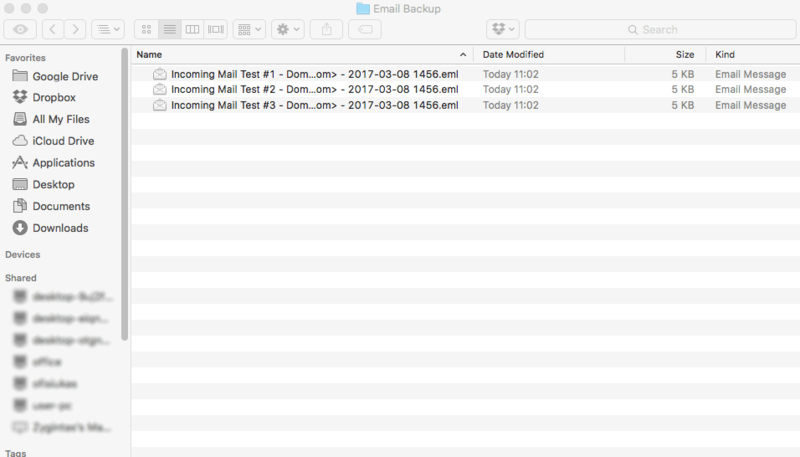 By finishing this tutorial you have learned how to backup your emails using 3 different desktop email clients. You have also learned the main difference between POP3 and IMAP protocols.